Lloyds Banking Group has agreed to sell its Halifax estate agency business to LSL Property Services for £1, and said 460 jobs would go. The loss-making business has 218 offices, 93 of which are franchise operations. 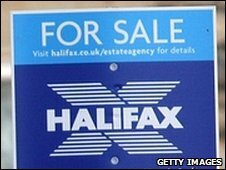 There are 121 Halifax banking counters located in estate agents, which will close down in early 2010. Branches will be rebranded as one of LSL's existing brands: Your Move, Reeds Rains or Intercounty. Lloyds said that 1,050 employees would be transferred to LSL after the sale and 360 of the 460 jobs due to go will be full-time positions. It said that compulsory redundancies would be a last resort. The jobs will go among staff operating the banking counters within estate agents. Lloyds said that the vast majority of the branches had a Halifax or Lloyds TSB branch within one mile of them. Lloyds said that the decision followed a strategic review, "which concluded that an estate agency operation is no longer integral to its business model".